Time Clock MTS allows you to define an unlimited amount of public holidays. Time Clock MTS can allow for holidays in payroll and overtime calculations. 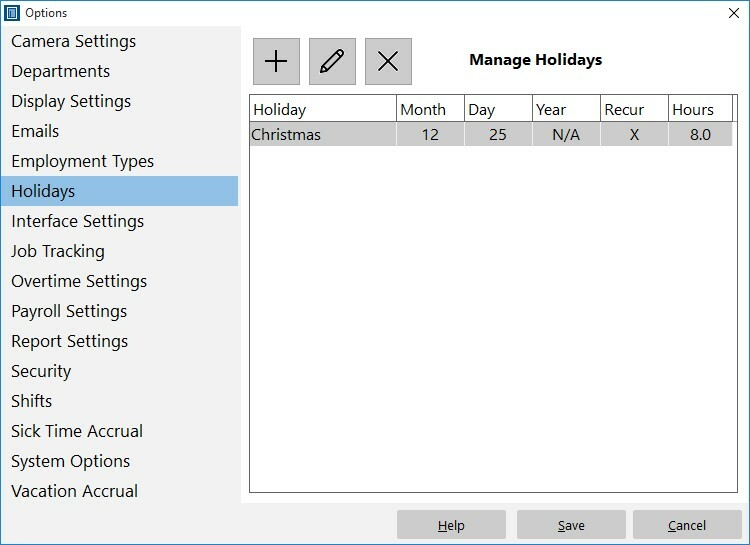 The Holidays options screen is where you can add, edit, or delete holidays. Defined holidays are displayed in a list. To Add a Holiday click the button. To Edit a Holiday click on it in the holiday list and click the button.To Delete a Holiday click on it in the holiday list and click the button. Holidays can be defined as either recurring or on a specific date. A recurring holiday would occur on the same date every year. A non recurring holiday might occur on a different date every year (such as Thanksgiving).